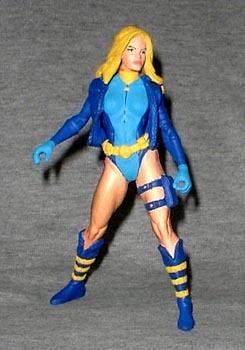 Back when I was customizing regularly, I made a figure of Oracle and almost immediately began receiving requests for her Birds of Prey compatriot, Black Canary. I thought this would make a fine figure for my first tutorial, since the customization doesn't require a lot of sanding or sculpting - it's basically just a simple repaint. 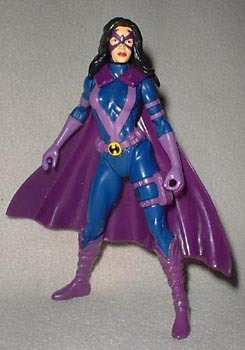 I chose to begin with the Total Justice Huntress. She had the right hair length, and her basic costume wasn't too far off from what we'll need. Our first step will be to Boil n' Pop the head, which we'll save for later. 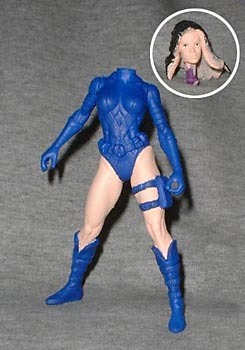 Then apply your base coat of paint - I chose a nice, medium, blue because it was dark enough to cover the various purples of Huntress's costume, yet light enough to be covered in just one or two coats later on. At step three, we begin to get some detail. I mixed a blue that was darker than the basecoat, and started on the fleshtones as well. When painting the head, don't worry too much about keeping the pink confined to her head; after all, any paint that got on the hair will just make it easier to make that black hair blonde later on. With only two colors left to go, we're in the home stretch. We paint a light blue stripe down the center of Canary's torso (don't forget her back while you're at it), and create her gloves as well. The yellow will most likely take more than one coat, but since it's used in such small amounts over so many parts of the figure (belt, boots, hair, collar and zipper-pull), by the time you're finished giving everything the once-over the first area you painted will be dry and ready for its next coat. 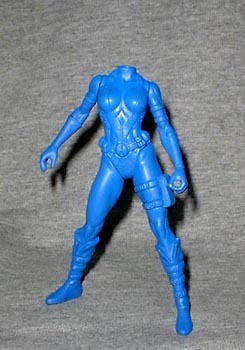 Once everything is dry and you've sprayed on your sealant, all you need to do is slip on the jacket from the Marvel's Most Wanted X-Man, replace her head, and you're set. You've now got a fine addition to your DC action figure lineup and one that looks darn good, to boot!